Asus has reclaimed its title as, “The Selfie King” by launching three picture-centric smartphones – one of which is the high-flying Zenfone 4 Selfie Pro. This new and improved Asus phone will aid in your million attempts at taking a selfie or wefie (group selfie) because of the unique Selfie Master app and powerful multifaceted cameras. 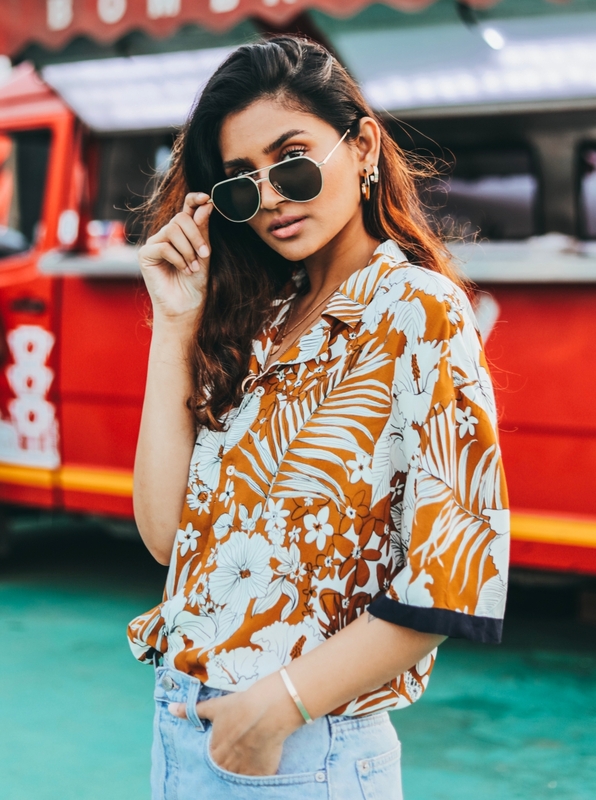 As you all know, a lot of my picture content is taken on-the-go, and as a lifestyle blogger I often need to showcase clothing, jewellery or events – which means a good quality camera is a must. When I put the Zenfone 4 Selfie Pro to the test, it actually made my job so much easier as I was not wasting time trying to find solutions on the spot (lighting, makeup, asking someone to take wide shots). This all-in-one phone gave me beautiful and sharp images, even when the lighting was bad or when I wasn’t feeling my prettiest self. Plus I no longer have to lug around a heavy DSLR with me because of the manual mode on this phone I can get professional quality images with ease! We all know that when it comes to making blogs, or being on social media, half the success lies in the technology you use, and this selfie phone definitely made the cut. The design of the Zenfone 4 Selfie Pro is sleek and stylish. It has a smooth matte metal body which is lightweight and strong, thanks to the 2.5D Corning Gorilla Glass. It has a 5.5inch full HD display, with a fingerprint scanner which also doubles as your home button. Apart from the design, there are two things I love about the phone, one – the 24MP Duo Pixel front camera with a built-in Soft Light LED flash and two, the “beautification [camera] mode” – that allows you to enlarge your eyes, soften your skin tone and balance your facial features. Together, this becomes a total selfie game changer, making all my pictures turn out great, and I won’t lie, it got pretty addictive (yes, it’s so good!). The beautification mode also works if you have two people in the shot, so no more depending on Snapchat to accommodate couple filters! Sounds tempting already? The beatification mode on this generation Y phone works for photos, videos, and live streams, so you can always expect perfect footage while you document all the precious moment of your lives – morning selfie, office selfie and not to forget your most important travel selfies! Now, your pictures will pack a punch with that front camera panoramic option, (available on all phones in the Selfie series) a feature only known to latest luxury phones. The camera uses Sony IMX362, a powerful image sensor, and an f1.8 lens, which makes sure all your pictures are clear even in low light and 1.4um EIS for higher picture quality. It also accommodates 4K video recording, packed with DTI Technology and Super Pixel Technology that will make your camera phone take some of the best pictures. It also has a + 5MP, f/2.2,120 Wide View angle camera in the front for all those integral group shots. Yes, this potable selfie machine will be your companion through all your entrepreneurial or social media adventures. It is definitely the phone to ask for when taking those tricky group shots at weddings, family reunions and birthdays, no time-consuming adjusting required and of course, no more selfie sticks! Further, its smart tech allows you to create separate accounts on apps such as WhatsApp, Facebook, Facebook Messenger and Instagram, a feature massively useful to me, and something all professionals or hobbyists would love! Softlight LED FlashRear camera mode – Auto, Super Resolution, Panorama, Slow Motion, Timelapse, Beauty, GIF Animation, Portrait, Pro(32Sec Long Exposure). From all the selfie phones out there, ASUS has managed to pack more useful technology into their phones while keeping their prices low. The phones are definitely at par with phones like the Oppo and Vivo selfie series. Right off the bat, the Asus Zenfone 4 Pro has a much higher mega pixel camera than selfie phones made by the companies mentioned above. It also has expandable storage that goes up to 2TB, a size that’s very useful for people in creative fields. The all-important LED front flash not present on the higher-end Oppo F3 Plus, which you will find on all three of the Asus Selfie phones. Furthermore, the Vivo V5 Plus doesn’t have a wide angle camera, and neither of the phones (Opposed F3 Plus) have a front 4K video recording capability. So, when it comes to selfie phones, Asus has thought of everything that will give you the best creative experience. I am actually amazed by how befitting this phone is for a blogger or social media enthusiast. There are so many people these days trying to create all types of content for the internet, and a phone like this one could really help better their picture quality. If you know someone on the lookout for a phone with good camera capabilities or, if you know someone who makes good content anyway, this phone comes highly recommended!